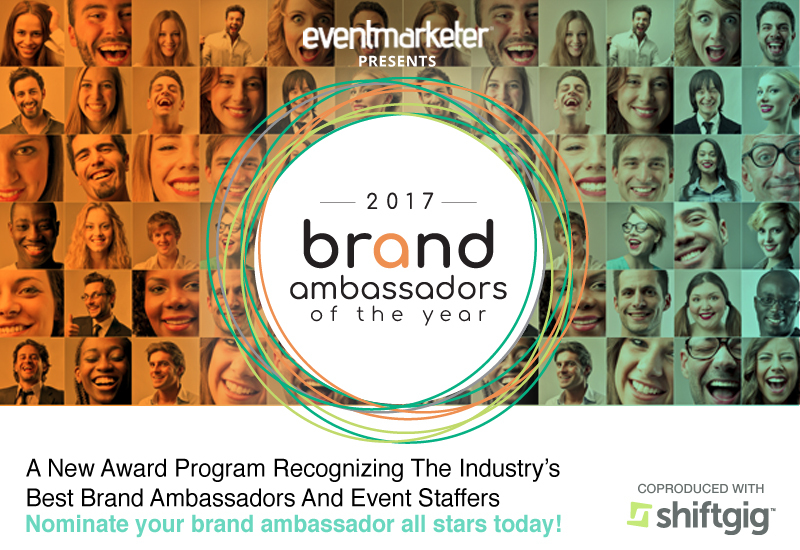 Event Marketer has unveiled the first recognition program to shine the spotlight on the industry’s brand ambassadors and event staffers. The 2017 Brand Ambassadors of the Year award program recognizes the tireless efforts of the men and women who represent the U.S. event industry on the frontlines of live experiences day in and day out. NOMINATE FOR FREE: The event industry is invited to nominate, for free, their top event staffers and brand ambassadors. We’re looking for the best and brightest brand ambassadors, the staffers that serve as the inspiration to others and through their work ethic and on-site efforts represent what a brand ambassador should be. Following a judging of all nominated event staffers, we will select 10 brand ambassadors and fly them to Chicago on May 3, where they will be inducted as the first Brand Ambassadors of the Year live during the industry’s Ex Awards gala. ELIGIBILITY AND CRITERIA: Any brand ambassador can be nominated. Brand ambassadors must be active in the industry and have worked at least one event over the last seven months—meaning any staffer who hasn’t worked at an event since September 1, 2016 can’t be nominated. All levels of brand ambassadors can be nominated, from hourly short-time BA’s to full-time tour managers. There are no age or experience requirements. Brand ambassadors that work for staffing companies, agencies or are independent contractors are all eligible. Self-nominations are not allowed. All brand ambassadors must be nominated by a marketing or staffing agency—or a client-side brand marketer. Agency heads of operations and logistics are ineligible; rather this recognition program is for the actual hourly and fulltime brand ambassadors who serve the event industry on the frontlines. It’s free to nominate so go ahead and nominate your brand ambassadors through April 10.